All prices include consumption of water and electricity, bed linens, towels and final cleaning. Extra bed (-) = 10 € per day. Staying less than 3 nights, we calculate 30% to the price. If you want to use an air-conditioing, there is the additional charge of 5€ per day. EXTRA BET(-) =10 € /tag. Miete umfaßt:Ausgabe von Elektrizität und von Wasser,Bettwäsche,Tücher und Endreinigung. turisticna taksa je vracunata v ceno. -v ceno je vkljuceno koncno pospravljanje, posteljnina, brisace, in poraba elektrike in vode. The island of Rab belongs to a group of inner Kvarner islands. It is situated in the bay of Kvarner between the islands of Krk and Pag. The Velebit canal divides the island from the mainland, and there is a distance of 1800 metres from the nearest, southeastern cape, to the mainland. A population of 9 565 inhabitants lives in the area of 90,8 km2, in eight settlements: Rab, Lopar, Mundanija, Supetarska Draga, Kampor, Barbat, Banjol and Palit. According to the regulation about local government the island of Rab is one district, and the settlement Rab is administrative, governing and cultural centre of the whole island. Geographical position, suitable climate, flourishing Mediterranean vegetation, beautiful beaches, clean sea and abundance of sun, as well as a valuable cultural-historical heritage have all been favorable for the development of tourism. Today Rab is one of the most developed islands for tourism. 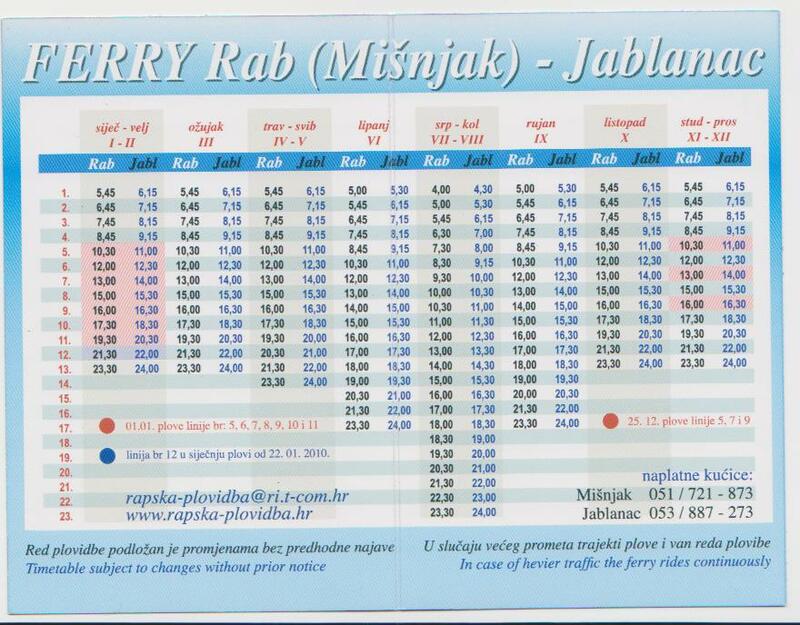 In the central, cultivable part of the island, olives, wine grapes and vegetables are grown, whereas large portions of the island are covered with macchia and Mediterranean oak forests.The island is connected to the mainland by ferryboat lines between Mišnjak and Jablanac, there is also a ferryboat for the island of Krk: Lopar (Rab) - Baška (Krk).otok RAB.